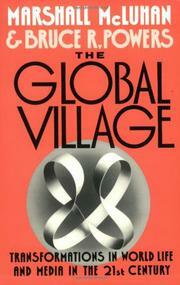 A quarter century ago, media guru McLuhan (d. 1980) wrote his famous Understanding Media. Now, in a posthumous volume cowritten by McLuhan's friend Powers (Communications Studies/Niagara U. ), the premises of that work are updated. This collaboration stems from research undertaken by the authors at the Centre for Culture and Technology in Toronto. Their analysis of the worldwide impact of video-related technologies takes the myth of Narcissus (central to Understanding Media) a step further. McLuhan was struck by the fact that when men first went to the moon, we expected photographs of craters but, instead, the quintessential symbol of that adventure was the dramatic picture of earth--ourselves: "All of us who were watching had an enormous reflexive response. We 'outered' and 'innered' at the same time. We were on earth and the moon simultaneously." The authors refer to this kind of moment as a "resonating interval"--"the true action in the event was not on earth or on the moon, but rather in the airless void between. . ." In their analysis, this resonating interval represents an invisible borderline between visual and acoustic space. The distinction between the two "spaces" marks the major premise here, with visual space representing the old traditions of Western Civilization--left-brain-oriented, linear, quantitative reasoning--and acoustic space representing right-brain, pattern-producing, qualitative reasoning. Because of electronic communications, the authors believe, these two mind-sets are "slamming into each other at the speed of light." While most societies view themselves through the past, usually a century behind, present-day changes occur so rapidly that this "rearview mirror" doesn't work anymore. By use of what they call the "tetrad," the authors contend that they can postulate four stages in any invention or trend to determine what the final result will be--what it will "flip over" into (e.g., money flipped over to credit cards; the telephone to "ominpresence." as in teleconferencing; cable TV should flip over to home broadcasting; electronic-funds transfer should flip over to "an intense state of credit-worthiness as pure status"). Dense, heavily technological writing--but with the occasional insight that reminds us of what once brought such renown to McLuhan.